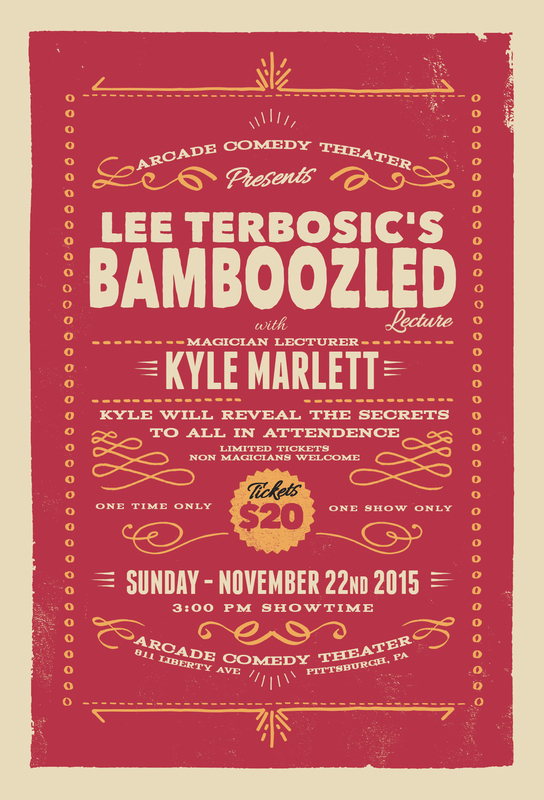 BAMBOOZLED LECTURE 2015 DOES NOT DISAPPOINT WITH A PERFORMANCE AND LECTURE FROM SUPERSTAR LAS VEGAS MAGICIAN KYLE MARLETT. KYLE IS FAMOUS FOR CREATING TRICKS FOR SOME OF THE BIGGEST NAMES IN MAGIC BUT THATS NOT ALL HE DOES....WITH APPEARANCES ON THE TONIGHT SHOW, WIZARD WARS AND DON'T BLINK KYLE IS ONE OF THE MOST IN DEMAND MAGICIANS WORKING TODAY. KYLE WILL LECTURE ON HIS STAND UP & CLOSE UP MAGIC CREATIONS THAT HAVE MADE HIM A HUGE NAME IN THE MAGIC COMMUNITY. PLEASE JOIN KYLE MARLETT FOR A SPECIAL ONE TIME ONLY EXPERIENCE THAT WILL LEAVE YOU READY TO AMAZE & INSPIRE. WHY: YOU CAN LEARN MAGIC FROM ONE OF THE BEST! WHAT: KYLE IS TEACHING ALL THE SECRETS TO ALL HIS FAVORITE EFFECTS.